Day 1 began a little slow, with vendors arriving between 9:30 and 10:30 am. We arrived about 10:15 and promptly began setting up our bloggers booth. After we got the internet set up, we began live podcasting via Cinchcast.com with 2-3 minute updates throughout the morning. You can visit our page on Cinchcast.com here, or check out our Peppers at the Beach page. Some of the vendors stopped by to say “hello”, but most all of us were busy just getting set up and underway. A decent crowd of people kept everyone busy, and we noticed a large number of folks exiting the Peppers store with bags of sauces in hand. 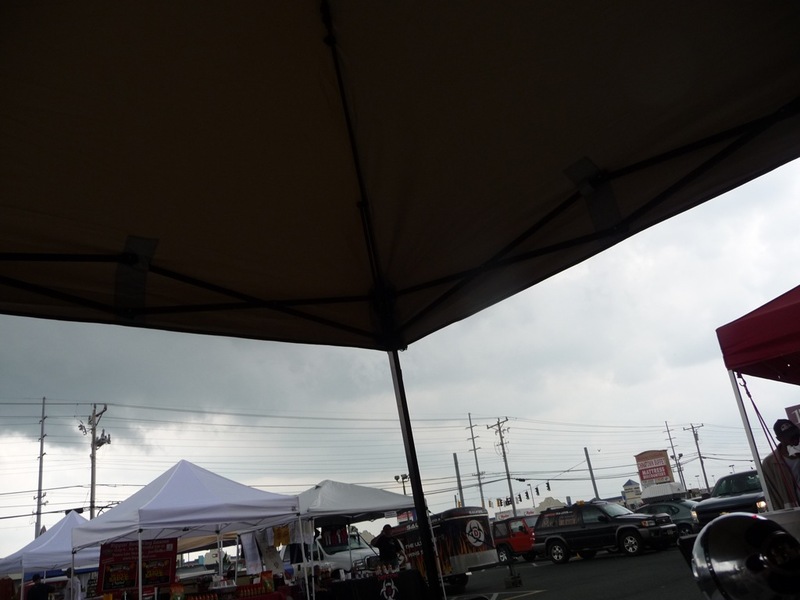 Eventually, the clouds grew heavy, and the rain began steady about 2:30 pm. With no relief in sight, vendors packed up, with hopes that Saturday would be much better – sunny, 70+ degree weather, no wind… we are hoping for a much better day on Saturday. Or if you prefer, there is a gallery of the photos below where you can click each to get the large photo. We did capture Chip Hearn with Johnny McLaughlin of Heartbreaking Dawns trying Johnny’s Kangaroo Sausage Sliders. You can click each photo for a bigger view. For all of our audio updates, be sure to visit our Peppers At The Beach Page and click on the big play button in our Cinchcast stream. We are looking forward to a great Day 2 with the arrival of bloggers Buddah, Scott Roberts, Doug Spiros and James Beck. Looks, and sounds like another great event.